1. Equipped with famous brand engine showing advanced capacity, low fuel consumption and high economic efficiency. 2. Reasonable distribution of speed, high efficiency in both farm working and transportation. 3. 150L enlarge fuel tank, long working time. 4.JpV clutch from the USA. 5. Optional to install 16F/8R creeper shift or 8F/8R shuttle shift, the shifts matched reasonable, have a good agricultural adaptability. 6. Optional double speed PTO( Power Take Off): 540/1000,760/1000r/min showing high working effiency. 7 Optional PTO shaft of 6 spline or 8 spline, adaptable for agricultural equipment of all over the world. 8. Streamlined appearance design, beautiful and generous. 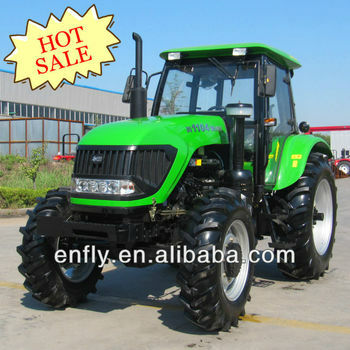 We are a leading company in China, with many years experience in machinery, now researching 260hp tractor. At present, the main products of our company are ENFLY brand with the range of 40HP -110HP. Especially the 40hp-55hp and 80-110hp series sell very well, which have exported more than 30 countries and regions. Also, we have the sole agent in Australia, Malaysia, Indonesia, and Singapore.